It's no news to you, Darling, that summer is officially here. The longest day of the calendar year has come and gone- with June now a memory. And blueberries are shyly making their post solstice appearance in the northern states. The kindest season is far too brief. As the Bard of Avon once penned, Summer's lease hath all too short a date. If you must skip to the recipe- do so now-- who am I to hold you back, to deny you even one more minute of partaking in this (rather modest) indulgence? But I confess, I am in a waxing mood today. And feeling lost in thought daydreams. Balancing opposites. I believe in the here and now (more than the promise of ever-after). Not that ever-after doesn't hold enduring charms. The swath we name eternity is threaded through and through with everyday blinks as brief as a silk worm's life. Which, as it turns out, is perilously close to a single, fleeting summer. In my view, if I am honest with myself and paying attention, eternity can be found inside a June. Within a child's hand clasp. Echoed in a tea cup. All that I long for, wish for, dream of, has already happened, this I know. In some far off starlit part of me that remains forever untouchable and true, eternity is happening now, and breathes within the tiny beating bud of even my fears and pain. It knows no boundaries, or Gregorian demarcation. It is patient. And full of music. I see it flicker in my sons' eyes. And the moment I spot it, it is already gone, light years away, clean and immaculate. Nothing evokes the pleasures of summer like a fresh blueberry crumble, warm and purple and sweet. I used quinoa flakes and millet flour for the gluten-free crumble-crisp topping. Quinoa flakes have a light, delicately nutty flavor that pairs beautifully with brown sugar, cinnamon and blueberries. Blueberry crumble-crisp is a gluten-free family favorite (you may remember this recipe), now made even tastier with new ingredients. And no xanthan gum. Preheat the oven to 350ºF. Rub the inside of a 9-inch baking or gratin dish with a dab of coconut oil. 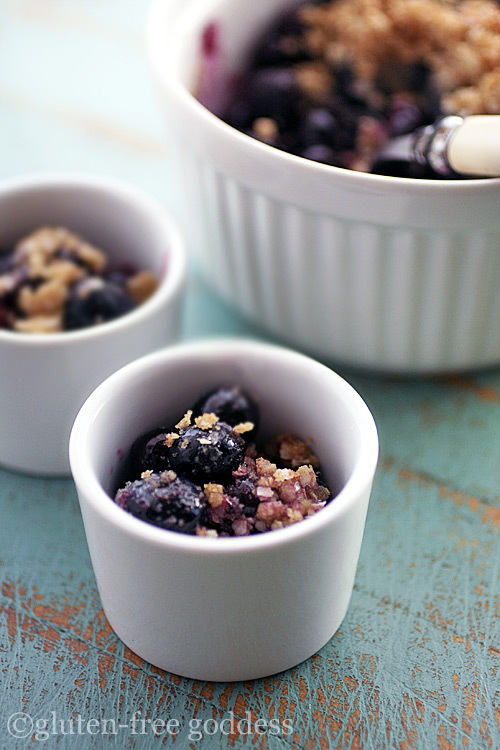 Place the blueberries into a bowl and sprinkle with the turbinado sugar. Toss to coat. Pour them into the greased baking dish and distribute evenly. In a separate bowl, combine the quinoa flakes, GF millet flour, brown sugar, cinnamon, and sea salt. Add the coconut oil. Stir in or rub the coconut oil and dry mixture together to create a sandy, crumbly texture. 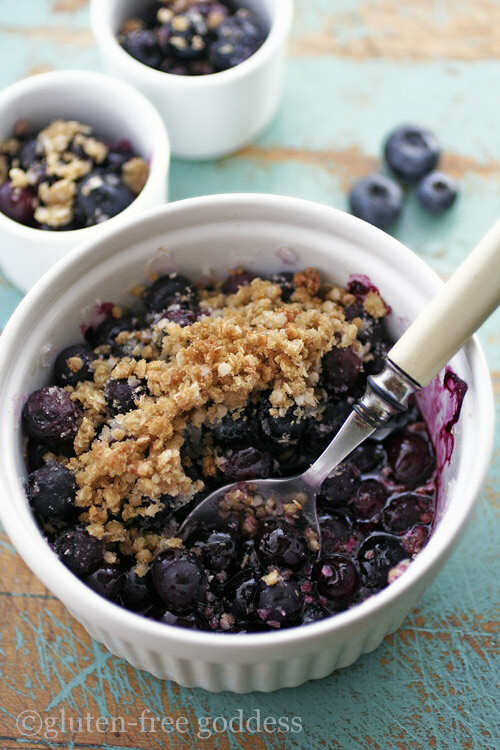 Sprinkle the crumble topping over the blueberries. Bake in the center of a pre-heated oven till browned and slightly bubbling. Check for desired tenderness with a fork. I baked mine for 25 minutes because I like my berries tender but not soft. If you prefer your fruit traditionally soft, bake it for 35 minutes. Set the crumble aside on a rack and allow it to cool a bit before serving. I love it slightly warm from the oven. A scoop of vegan Coconut Vanilla Ice Cream is entirely optional. This is a vegan gluten-free recipe (dairy-free) but if you prefer using butter, use butter instead of coconut oil. Quinoa flakes are found in the hot cereal section of many natural markets. They are light, nutty tasting, and packed with protein. To substitute millet in this recipe I'd use sorghum flour. Or try GF buckwheat flour (if you enjoy the taste of buckwheat). Please make sure the millet flour you use is indeed gluten-free. 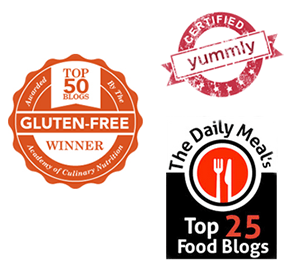 Some brands of gluten-free flour are testing with higher than acceptable levels of gluten cross contamination. 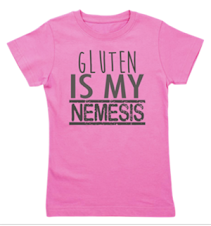 If cross contamination is an important issue for you and your family, I suggest you subscribe to Gluten-Free Watchdog, like I do. I don't add nuts to my blueberry crumbles or crisps- but if you love a good nut with your berries, darling, add a half cup chopped nuts to the topping. 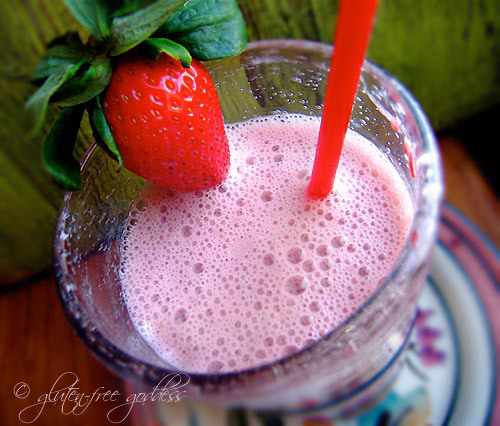 An earlier version of this Gluten-Free Goddess® recipe originally appeared in Allergic Living.